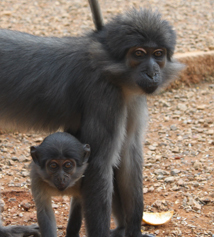 Sooty mangabeys (shown here) are among the non-human primate species considered as SIV's natural hosts. Studying them can help humans learn how to better manage HIV infection. Credit: Yerkes National Primate Research Center. Some monkeys can survive infection by SIV (simian immunodeficiency virus), a relative of HIV, and not develop AIDS. In these monkeys, who are considered natural hosts for SIV, the immune system appears to display patterns of peaceful coexistence rather than the all-out conflict HIV provokes when it infects humans. Because SIV’s natural hosts, which include sooty mangabeys, African green monkeys, madrills, drills and suntailed monkeys, have adapted to manage infection rather than fight and lose, we have much to learn from them, a team of scientists from Yerkes National Primate Research Center proposes in an article published this week in Science. The authors include Ann Chahroudi, MD, PhD, Steven Bosinger, PhD, Thomas Vanderford, PhD, Mirko Paiardini, PhD, and Guido Silvestri, MD. Silvestri is Chief of Microbiology and Immunology at Yerkes and a Georgia Research Alliance Eminent Scholar. Studying how SIV and its natural hosts co-exist could show medical researchers how to improve long-term care for people infected with HIV and reduce mother-to-infant transmission, as well as guide the development of an AIDS vaccine, the researchers write. Distinctive features of SIV natural host infection include a low level of immune activation and a low rate of mother-to-infant transmission when compared to humans. Genetic analysis has shown that HIV infection of humans arose through multiple cross-species transmissions of SIV from nonhuman primates. This reflects evolutionary history during the last several thousand years, the authors postulate. Researchers have observed a small number of HIV-infected people exhibit a “natural host-like” phenotype, in which low levels of immune activation are seen. In most humans, HIV infection leads to chronic immune activation, which causes health problems even in people who receive long-term antiretroviral treatment. During infection, SIV’s natural hosts also preserve particular types of immune cells including Th17 cells, which help maintain the barrier function of the intestines, and central memory CD4+ T cells, important for the immune system’s ability to respond to previously encountered bacteria and viruses. Understanding how SIV’s natural hosts preserve immune function could help improve medical care for people living with HIV infection, they conclude. Together with NIH researcher Nichole Klatt, PhD, Silvestri is also author of a recent Perspective piece in Science Translational Medicine about the role of CD4+ T cells in HIV infection. Silvestri’s research is supported by the Yerkes National Primate Research Center and the National Institute of Allergy and Infectious Diseases.